When I was young the term ‘inventor’ was used instead of ‘innovator’. My image of the inventor was a lone, crazy-haired guy on the brink of madness, working alone in the lab, testing and retesting his ideas, then revealing the final product to the world. No wonder he was crazy, doing it all alone. The difference today is that the process of innovation is open, organic and it requires to cross-disciplinary meeting of minds. The best ideas take shape when the right team can develop them. Case study: SCIL wants to lead the change, to help schools and educators to think differently about the nature of learning in the 21stC. We already connect with many passionate educators from around Australia and the world when they visit, but what if we went to them? So we are planning a roadshow, Making It Mobile, taking our PD to other cities and presenting a workshop that will equip and inspire, but also role-model a project-based approach to learning for professionals. Usually I spend a few days or more playing with an idea in my head. I think through the implications, the cost/return scenarios, the people needed and the logistics, just to get it straight in my head that it’s viable. Many ideas don’t make it past this point. Making It Mobile: I was thinking about how many educators from across Australia to learn from us. Long distance travel limits number of people who can gain the experience. So, could we take a team to them? It would be more cost-effective for the local schools. What would that mean for us? For me, this actually means a literal pencil and paper. I write and draw my ideas of what it could look like and do some preliminary numbers. It’s still private, but more concrete. Making It Mobile: I love to plan on a sketchbook with a pencil, it helps me to make my ideas tangible. In reality, I may never look at it again, but it is a very important part of the process. This isn’t ‘tell the world’ but it is to just flag the idea to a few key people who are trusted and honest. It is tempting to talk to ‘fans’ to tell you what you want to hear, but better to those whose gut-feeling you trust. Making It Mobile: Well, the boss, first. Just checking that this idea was one that would add value to SCIL, that it wouldn’t drain resources – human and financial. Then to a couple of colleagues, “What do you think if…” The reality is, a favourable response from the right people means that I’m committed to getting started. 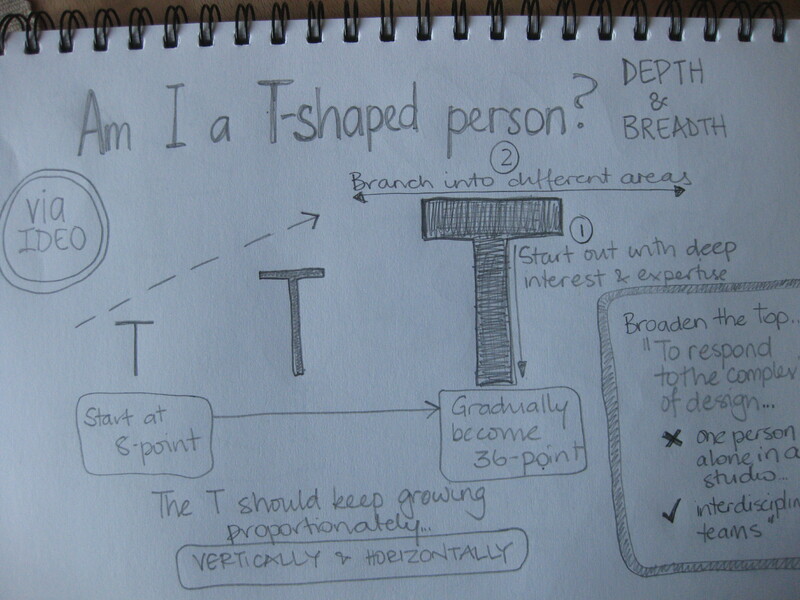 Tim Brown from IDEO talks about T-Shaped people. The vertical refers to the depth of skill in an area and the horizontal, the collaboration across disciplines. We all need to become T-shaped people. Gain deep interest and expertise, then branch into different areas. The horizontal of the T enables us to collaborate across disciplines. One person sitting alone cannot adequately respond to the complexities, whereas interdisciplinary teams do. 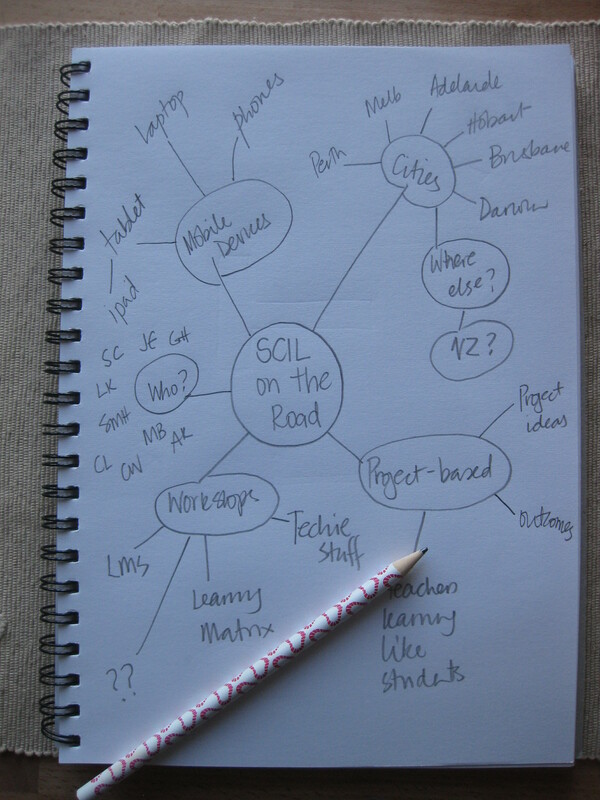 Making It Mobile: SCIL-on-the-road started with an idea, but I definitely don’t have the expertise to make it happen, so I took it to the team. We have amazingly rich planning meetings that require a breadth of skills from each of us. The process if also great fun, so much better than trying to do it alone. The name Making It Mobile wasn’t my idea, but that’s the beauty of the team. There is danger in just piloting a prototype – its tempting to stop and analyse. The momentum that has built up around the idea can be lost through the evaluation of the pilot. Dream big and go with your idea. Making It Mobile: The team believes in the idea, we’re developing a scalable and replicable model and we are planning a series of events in different cities. So we will just get started. At the end of the year we will reflect as we plan for 2013.. When you believe in an idea and you’ve started implementation, then evaluate and tweak at each stage of its ongoing development. The beauty of the creative team is that there is a mindset of continual improvement. Making It Mobile: I can imagine that each of these workshops will look a little different from the last. One important reason, is that with the transparency and openness of the team no one person owns the idea, the team does. Each of us are open to scrutiny, because we want this to be the absolute best PD for educators. Keep visiting scil.com.au, sign up to the newsletter and follow @scil on Twitter. Maybe we might come to a city near you.